I played Doom III, it was cool, I think I finished it…I never played the other ones, I really don't like First Person Shooters…they were all alike and we got flodded with them, so I just wasn't interested, but thought I would give III a try, it was all right. It was pretty scary in some parts. 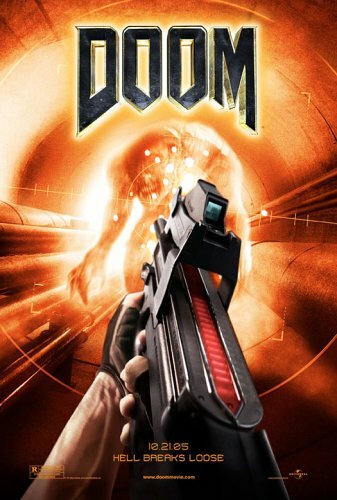 Doom the movie, not so scary in any parts. So…like…wasn't the story about hell? Pools of blood? Demons from another dimension, and that Dimension is hell? This was like resident evil on Mars or something like that. I wanted Demons, and such, that were from hell, not some chemical. That is no fun and it has been done to death. Why did they change the base story. It was good, if they kept that, it might have been a better movie, and might have made some more money. This movie TANKED. It after 2 weeks has made 20% of it's budget back, and that is bad. Sadly for them, I can not reccomend you seeing this, if or if not a fan of the game. Acting, crap. Monsters, Few. Boobies, None. Scaryness, not much. Unlikable Characters, many. Overall, Poopy. There was a cool scene in the end, where they actually did it in FPS style, where it worked just like the game, which was kinda fun, but it lasted 3 minutes, and was only for novelty. I can not really even recoomend this movie for rental in your queue…but I would say if your hard up for it, its not BAD. Just not really worth the price of admission. Rent it if you must, you will not hate anyone for having seen it, unless your an uber fanboy looking for Doom 1 made into a movie.